The inaugural Gauley Festival celebrated the derailment of a proposed hydro-electric project. Today, the festival brings to mind images of carnage and rowdy boaters. 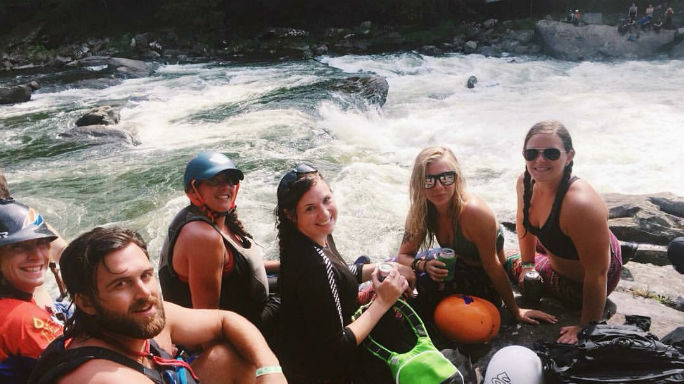 NRS Field Rep, Jean Slade, checks in from her van down by the river with these pro tips to maximize your Gauley Fest experience this fall. The Gauley River is a 105-mile river in West Virginia that merges with the New River. 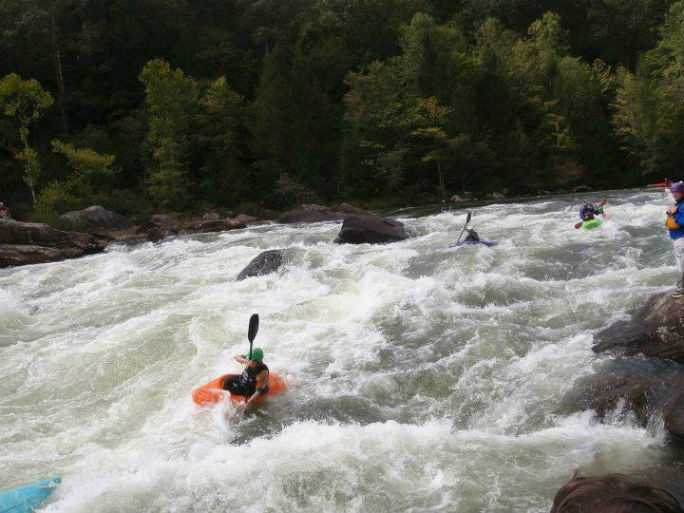 It’s one of the most popular whitewater runs on the East Coast. The Gauley can be run year around, but the flows fluctuate depending on rainfall and the water level of Summersville Lake, a reservoir formed by the Summersville Dam. However, in late summer, early fall, a set of scheduled dam releases creates Gauley Season. 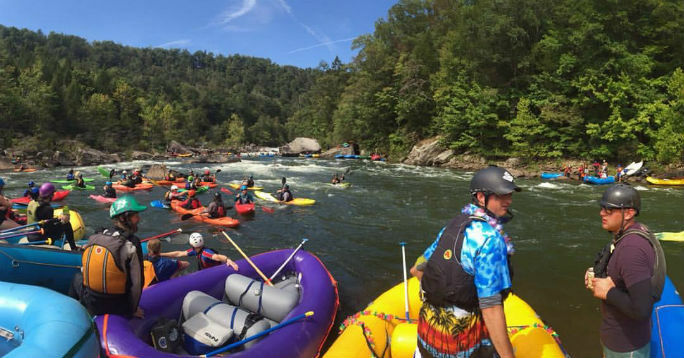 At the start of Gauley Season, paddlers around the country flock to West Virginia, throw tents on a baseball diamond and celebrate Gauley Fest. Gauley Fest began in 1983 as a celebration of the derailment of a hydro-electric project that would have stolen one of the whitewater community’s most precious resources. Today, it remains the American Whitewater Association’s largest fund raising effort. Although its roots were planted in a noble cause, now, the internationally renowned Gauley Fest is mostly regarded for its party-hard nature. But at its heart, it’s still a celebration of not just the Gauley, but rivers everywhere. And it’s one hell of a good time. The best advice ever given to me about GF was to get there early and DO NOT SPEED. The festival grounds will fill up quick, leaving distant or less desirable parking and camping options. Arrive early to stake your claim. Light sleepers should bring earplugs or seek out distant corners because Gauley Festers are known to ring in the dawn. As far as speeding, Summersville, West-By-God-Virginia isn’t a lot of things, but it is the speeding ticket capital of the world. Summersville’s finest will be more than happy to send you home with a souvenir you can’t frame and display on your mantle piece. Believe me, I’ve had my fair share. Once you’ve arrived, staked your claim and set up home for the weekend follow these easy steps to guarantee one helluva Gauley Fest. 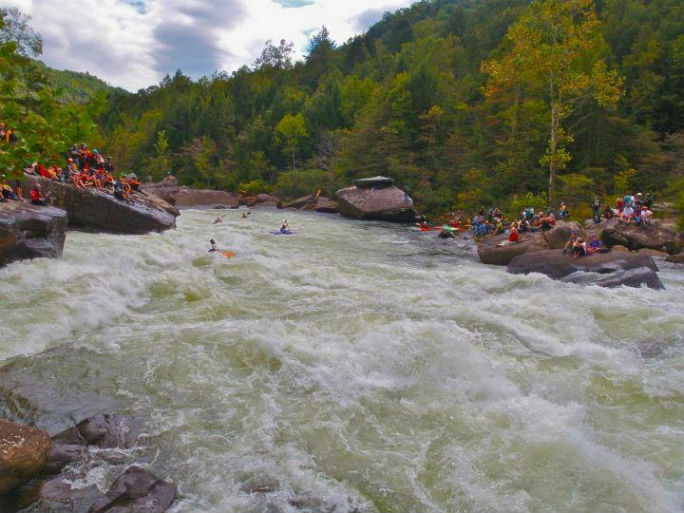 The Lower Gauley is a surfer’s paradise and an excellent challenge for the intermediate paddler with its big but friendly nature. In full disclosure, most would say the Lower G actually has superior freestyle kayaking features compared to the Upper. If your urge to surf is bigger than your appetite for big water maneuvering, head to the waves of the Lower G. With limitless surf spots including Diagonal Ledges and 5-Boat Hole, some say the Lower is the best playboating on the Gauley. You can remember the middle as being the tamest section, harboring only one class IV rapid. It boasts the Perfect Wave, a beautiful, glassy, wide wave, which is a favorite of the paddleboard surf crowd. It’s easily accessed as a park-and-play feature via a trail near the Upper take-out. The Upper G is one of the crown jewels of east coast whitewater. Even though the Upper is no secret, and it has been run since the sport was in its infancy, it has never lost any of its excitement. No matter how experienced you may be, the upper still offers a thrill to all that brave her tumultuous waters. But only sample. Gauley Fest food is festival food at festival prices. Think about your local fair and that’s mainly what you’re looking at. Not to say there aren’t any gems, like the pepperoni rolls sold at the Water Street Cafe booth. Pepperoni rolls are a West Virginian staple. Originating in the early 1900s, they were a popular lunch option for the coal miners of north-central West Virginia. Today, the white yeast roll baked with pepperoni inside is a convenience store must-have and a Gauley Fest treat. For the majority of the weekend though, I recommend packing a cooler and cooking most of your meals at camp. Don’t forget your camp stove or firepan; campfires aren’t allowed within the festival grounds. Whether you’re a paddler or just a spectator, everyday is a long day of festivities. If the thought of rolling out of your tent to camp coffee and oatmeal isn’t enticing, head toTudor’s Biscuit World instead. Tudor’s has breakfast options with the calories you’ll need to keep your energy up. It’s West Virginian fast-food at its finest: order at the counter and be handed a biscuit wrapped in grease-infused wax paper I recommend the Ron: a classic sausage, egg, and cheese. Gauley Season may be just getting started, but most manufacturers and retailers are winding down their busy seasons and cleaning out their inventory to make room for next year’s gear. Outdoor industry brands fill the festival grounds hawking their wares at deeply discounted prices. Much like grabbing a camp spot, the best deals go fast, so do your shopping early. And keep in mind, the best haggling tip is a cash offer. So hit the ATM, show up early and snag the piece of gear you’ve been lusting after for months. Don’t forget to budget a couple dollars for the annual raffle. You could win a custom-colored Dagger Green Boat in a lottery benefitting American Whitewater. What Gauley Fest lacks in solitude, it makes up in entertainment. On the river, it’s all about the carnage—raft flips, kayak swims, hole beat downs and surprise back-enders on caving eddy lines. Pillow and Sweets Falls deliver the best spectacle with the most carnage. Both rapids can be accessed by trail for those that don’t have the intestinal fortitude to run the river but don’t want to miss out on all the fun. The campground will be full of familiar and unfamiliar faces alike. Catch up with old friends, make new friends and throwback a beer or two with some of the whitewater world’s most iconic paddlers. With all ranges of whitewater craft and characters, you are guaranteed to see something new. On the river, patience and a few extra glances upstream are recommended. And throughout the weekend remember to save your energy. The days are fun, but Gauley fest goes well into night and the real party doesn’t start until the booths have shut down and the band has long left the stage. On Sunday morning, you’ve made it through Gauley Fest. You may think that you can’t go kayaking. You may think you can’t even walk. You can. But if you can’t, the Gauley runs every other weekend in September and October.